A lot of Indian restaurants and take away places serve complimentary green chutney which is usually eaten as a dip with pakora, samosa, kachoris etc. Having worked in a restaurant and knowing the secrets of some their cooking, I never eat these chutneys as I am never too sure how fresh they would be. My mum used to make this chutney fresh every single day by mixing all the ingredients in a mortar and pestle. This used to make the chutney full of lovely fresh-tasting flavours. The chutney used to have a lovely coarse texture too. With the invention of the food processor and blenders, these chutneys are very easy to make but they look more like a dip or sauce. 1. Put the ginger, garlic, raw mangoes, chillies and fresh coriander in a food processor. 2. Add the lemon juice, salt and a quarter cup of cold water. 4. The mixture doesn’t require any more water as long as you blend everything slowly. The salt and lemon juice will help produce the moisture required to blend all the ingredients. 5. Once you get the mixture very fine, the chutney is ready to serve. To make a dip or spread, you can transfer this mixture to a blender and give it a couple of swirls . 6. Save the chutney/dip in an airtight container in the fridge. Use a glass or a plastic container as the lemon juice may react with metal. This mixture will be fine for a week. 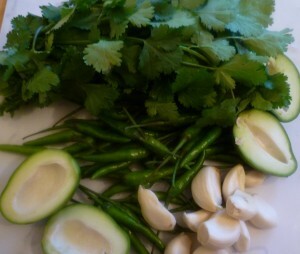 Tip 1 – The combination and amounts of ingredients used in the chutney can be varied to suit your taste. 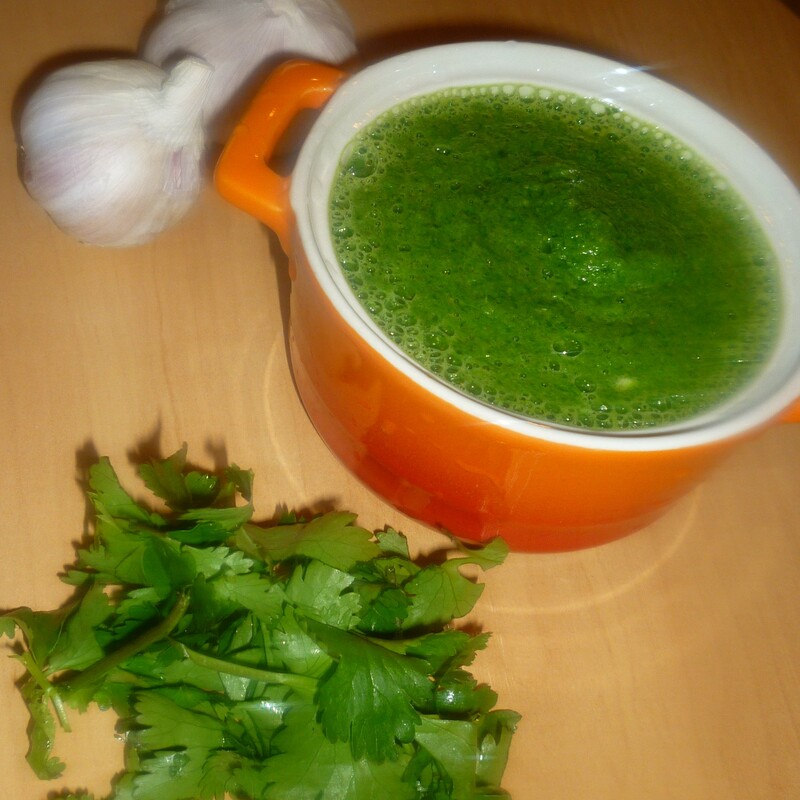 You can even substitute coriander for fresh mint or use both if you like. Tip 2 – As all the ingredients in this recipe are fresh, you can use this mixture to flavour your curries too. Tip 3 – You can transfer the mixture to an ice cube tray and freeze it. Remove the frozen cubes the next day and save them in a zip lock bag in the freezer. Again you can add a cube to flavour your curries and dalls. Tagged chutney, indian, recipe, vegetarian. Bookmark the permalink. Thank you Manjuben and Shielaji. Love it when you comment on my recipes.